The new Harley-Davidson SuperLow model reintroduces the pure pleasure of motorcycling. Balanced and responsive handling help rider and machine glide through corners with smooth confidence. 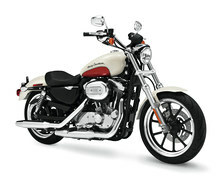 A low seat height, the broad V-Twin powerband and clean styling complete an appealing package. The SuperLow is an open invitation to get out and ride.